ADELPHI, Md. 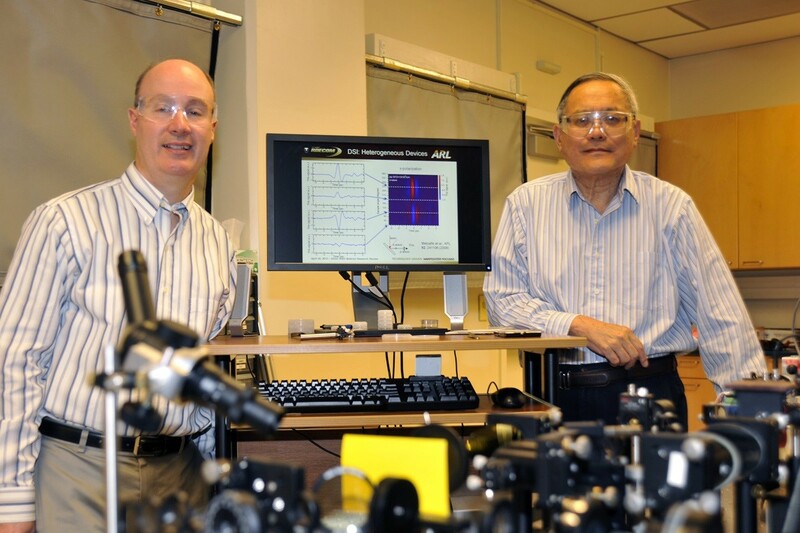 (Sept. 19, 2013) -- Current terahertz-based sources suffer from a number of drawbacks including high cost, complex fabrication, and restrictions associated with large externally applied voltages. The most common of these THz source technologies are photoconductive switches comprised of a semiconductor material and two parallel metal strips that act as electrodes through which a large voltage is applied externally. When a short, or sub-picosecond, pulse of light is incident between the strips, electrons and holes created by the light pulse are accelerated, leading to the generation of a broadband electromagnetic pulse with the frequency spectrum centered in the THz range (Fig. 1). The spacing between the metal strips can be as small as microns, and fabrication of such a microelectronic device is therefore costly and complex. Moreover, the external bias voltage can be limited by dielectric breakdown in air, restricting the amount of energy in each THz pulse. In an exciting new development, researchers at the U.S. Army Research Laboratory's Adelphi Laboratory Center in the Sensors and Electron Devices Directorate including Dr. Michael Wraback, Dr. Grace Metcalfe, and Dr. Paul Shen, have developed and successfully tested new ways of generating THz emissions that do not rely on these unfavorable features, and have promising futures in both biomedical and security applications. "We wanted to exploit the area between microwaves and infrared in order to gain an advantage that our adversaries do not have," Wraback said. ARL offers three different alternatives to the traditional THz approach that do not require the use of metal contacts and externally-applied voltage, through three different ARL patents. Through these alternatives developed, ARL researchers believe that current THz technologies can be improved and have a very promising future in both the biomedical field and in security applications. 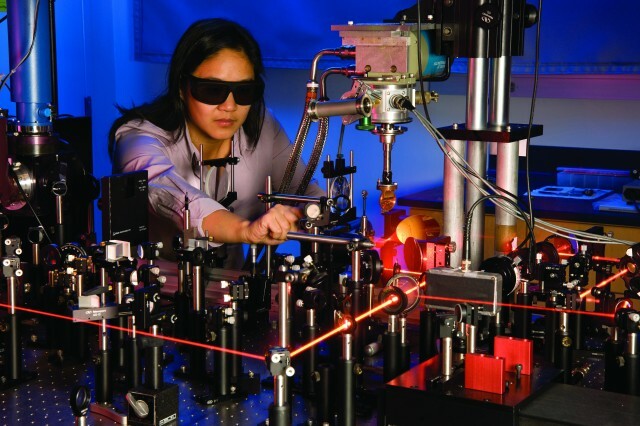 THz-rays are nonionizing, meaning that they pose no harmful threat to biological tissues--unlike x-rays, for example--and can pass through thin layers of low-water-content materials such as clothing, paper, wood, plastics and ceramics. As a result, ARL researchers believe their new THz source could be used to "see" high-resolution changes in the density of biological tissues near their surfaces, with the possibility of ultimately enabling handheld devices to identify potentially harmful anomalies during routine screening, hopefully reducing the time between initial detection and full examination. In addition, the ARL technology could be used to develop safer, accurate, noninvasive and more cost-effective ways to screen for malignancies, such as a simple breathalyzer test, and improved detection of tooth decay. ARL researchers also stated that their new THz technology has great potential in the biomedical field in terms of pharmaceutical practices. "THz technology is also very prominent in the pharmaceutical field, especially in the area of pill coating," said Shen. THz technology allows for the determination of the integrity of the structure of pills through the imaging of their coatings, which is a significant benefit for pharmacists. In terms of security applications, THz has potential investigative uses since many materials give off distinctive spectral "fingerprints" when exposed to THz radiation, such as explosives, chemicals, medications and illegal narcotics. 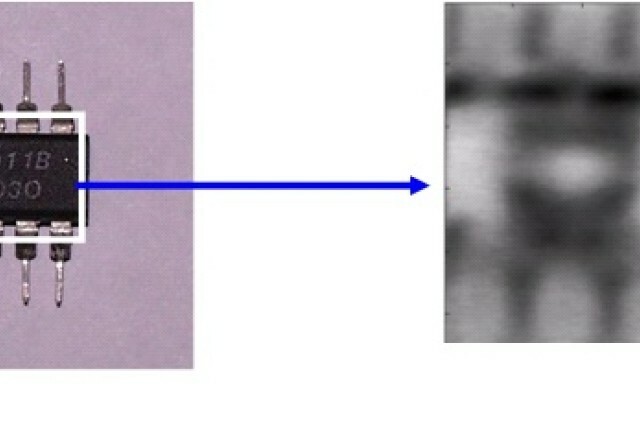 In addition, due to its special nondestructive nature, THz radiation can be used to distinguish between visually-similar materials, a capability ideally suited to quality control in applications ranging from food preparation to inspection of integrated circuit chips (Fig. 5). When it comes to benefits to our Soldiers, the researchers said that great strides could be made with THz technology in the areas of spectroscopy, short-range communication, imaging, and collision avoidance that could aid Soldiers in their missions on the battlefield. The use of THz technology with spectroscopy, or the study of the interaction between matter and radiated energy, could mean better identification of chemical and explosive materials. Short-range communication and imaging with THz technology could aid in the improvement of convoy and helicopter collision avoidance or imaging through obscurants. "If you have a convoy or helicopter in the desert or other environment in which backscatter from obscurants obstructs the driver's view, THz radiation can facilitate detection of other vehicles, but from a low range so others from a longer distance cannot detect you," said Metcalfe. The first alternative developed is the most general, in that it applies to a wide class of polar semiconductor materials that possess significant spontaneous and/or piezoelectric polarizations. 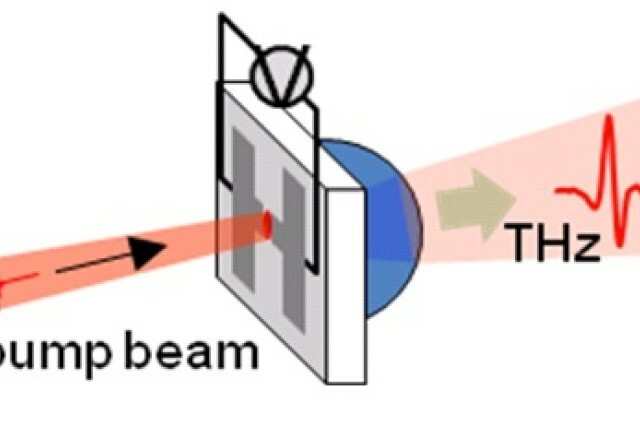 In this approach, a projection of the polar axis of the semiconductor lies in the plane of the material. 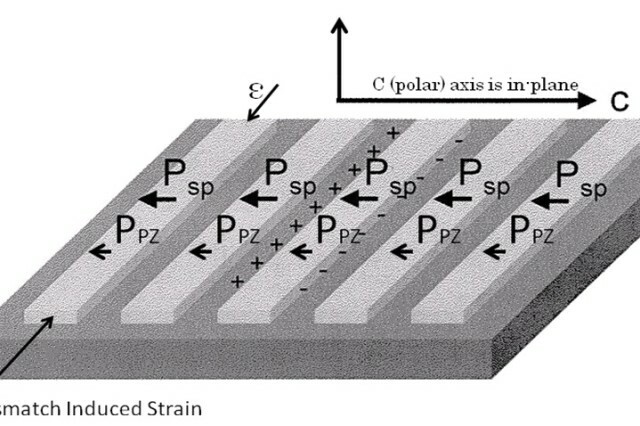 If bars defined in the material by etching are not parallel to the polar axis, the material polarization is terminated at the material/air interface, thus effectively creating an array of nanoscale photoconductive switches with large built-in electric fields suitable for THz generation (Fig. 2). This alternative has the capability of generating a large, broadband THz pulse with increased power, and can be realized both in wurtzite materials with large spontaneous polarizations, including AIN, InN, GaN and their alloys, and zincblende materials that have strong piezoelectric polarization, including GaAs, InGaAs and GaAsN. The second ARL alternative employs an even simpler approach that does not require any material processing steps. 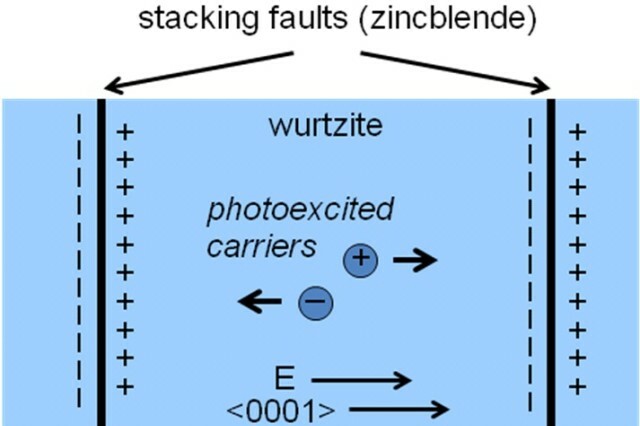 In this approach, wurtzite semiconductors with large spontaneous polarizations are grown in a nonpolar direction on lattice mismatched substrates, resulting in the generation of stacking faults that are manifested as quasi-periodic insertions of zincblende inclusions within the wurtzite matrix of the material. These spontaneously forming nanostructures, with an average spacing of approximately 10 nm, create high-internal in-plane fields associated with the termination of spontaneous polarization in the wurtzite material at the wurtzite/zincblende interfaces (Fig.3). The third ARL alternative also engineers strong internal fields in wurtzite semiconductor heterostructures to enhance THz emission. 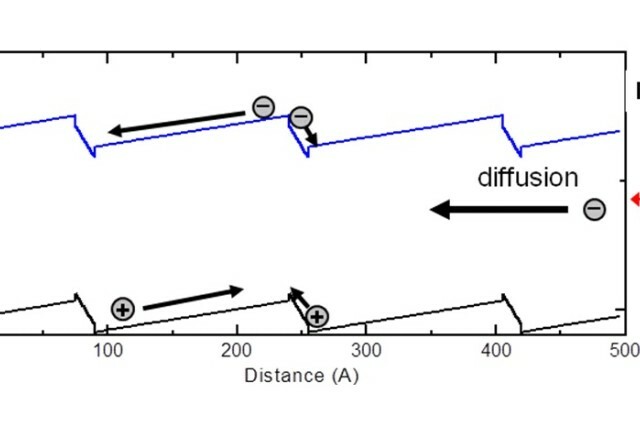 The difference is that nanostructures are deposited primarily along the polar direction with a component of the resultant field perpendicular to the plane of the device. Although others have taken advantage of such polar heterostructures to generate THz radiation from dipoles confined within quantum wells containing high-electric fields, the ARL researchers recognized that since the spontaneous and piezoelectric polarizations are much larger in some wurtzite materials. 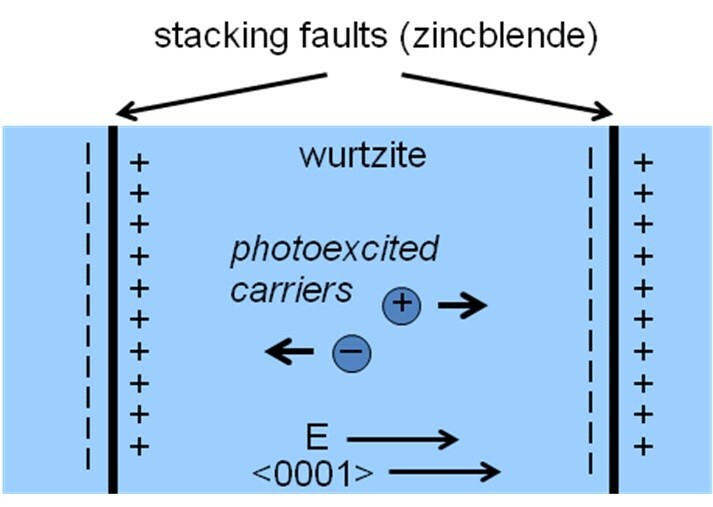 The electric field in the transport regions between the quantum wells in these wurtzite materials can be engineered to be large enough to create enhanced THz radiation associated with the electron-hole transport (Fig. 4). The appeal of these new alternatives is that they take advantage of properties within semiconductor materials to engineer high-internal electric fields, which can lead to larger THz pulses with potentially more power and greater bandwidth than what is currently realized. In addition, these alternatives are more desirable because they can be practiced with a wide range of cost-effective semiconductor materials. According to Wraback, there is still a great deal of research to be conducted with the THz alternatives developed by ARL. "In the future, we foresee improving the quality of the materials used in our approaches, engineering a THz source into a nitride semiconductor laser, forgoing the fiber laser currently used in order to control the THz waves administered, and developing more sensitive THz detectors to measure the THz waves," stated Wraback. This ARL technology is now available for licensing and cooperative research and development agreement opportunities.